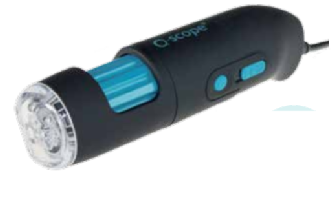 The Q-scope product range of digital microscopes offer the best solution for a broad range of applications like industrial quality control, forensics, medical & life sciences, ,science & education, art restoration and many other fields. Get connected through USB to your Windows or Mac computer to observe and analyse your captured or live images with our powerful user friendly (free of charge) software for advanced image processing. 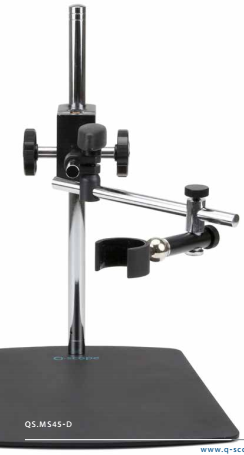 The Wi-Fi models can easily be connected to tablet computers. 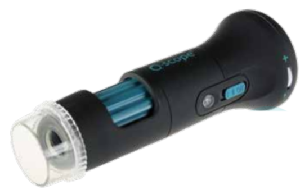 With a wide range of standard models plus, UV, IR ,Dermatology and WIFI versions the Q-scope series consists of models with numerous magnification ranges and a variety image sensors Q-scope has been designed in such way that it fits perfectly in your hand. 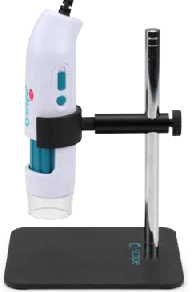 This allows a relaxed grip, which makes the usage of the Q-scope handheld microscope very easy and effortless. 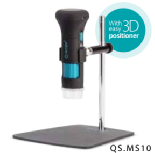 Ease of use is crucial, this is why the Q-scope digital microscope only needs one finger to focus, grab a picture and select illumination setting.